Burning a bridge is the recurring daydream of everyone who has ever lived in the history of the universe. I realize that may seem like an overstatement, but let’s gather some anecdotal evidence, and you’ll see how truly true it is. How many times have you played a scenario in your head before it happened? Ever think about walking into your boss’s office the day after winning the lottery, and how you’re going to finally say all those things you’ve been holding back? Ever think about that conversation you’re going to have with that significant other, and have your final statement planned out before you turn and walk dramatically out the door? Ever had the perfect comeback planned for that co-worker? We want to have that last word, the parting shot as we walk away, or the best mic drop. Here’s the problem: what happens when the lottery turns out to be a scam and you a) need to go ask for your job back or b) need to use that boss as a reference. What happens when that co-worker you just burned becomes the new manager of your department? As it turns out, sometimes we may actually need to walk back over the charred remains of that bridge. This same thing happens to our good friend Haman at the end of Esther. For most of the story, Haman is bent on destroying the Jews as a whole because of a personal anger at Mordecai. Finally, at the crucial moment, Esther tells the King that Haman is trying to kill her and her people, and the King storms off to (presumably) count to ten before reacting. In the few minutes he’s gone, Haman realizes that the King is not going to come back with good news, and he decides his only hope is the very same woman who just spoke up to the King. I find it ironic that Haman, moments before, was determined to wipe out an entire people because he was so enraged by the actions of one Jew, but suddenly he finds himself begging for mercy from the same people. 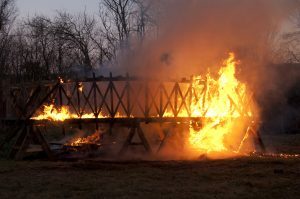 He thought burning that bridge would teach “them” a lesson, but it turns out they were the last strand of hope he had. I wonder what Esther would have done if the king hadn’t shown up at that exact moment. What if she would have had time to speak to the King before Haman was killed. Would she have supported Haman? Would she have used this as a chance to take vengeance? Maybe she would have begged the king for Haman’s life as well, to show the mercy of God? We’ll never know, but I like to think she would have at least tried. You never know what the next moment will bring. Maybe we shouldn’t be too quick to dismiss those who are “beneath” our notice right now. What if that co-worker you hope gets fired is the person doing your job interview at your next job? What if that guy you cut off in traffic with a friendly wave is the bank officer you will ask for a loan tomorrow? What if that pastor you vote out is the next head of your district? It might be that the people we think are “not us” today are the people we will be asking for mercy tomorrow. Jesus tells us to love our enemies, and pray for those who persecute us. Some of that is to model Christ’s love for all (pretty important), but it also could be for our own good (possibly more importanter). Only God knows what the next turn in the road will bring us, and treating everyone kindly could very well turn out to be for our benefit as well as theirs. Naturally, this doesn’t mean that we should be kind to people only because we might get something out of it, but that we should be kind to people because that’s what Jesus tells us to do, and we trust Him. Maybe our daydreams should be on building bridges, rather than burning them.